Keep your Healthcare Staff Connected. 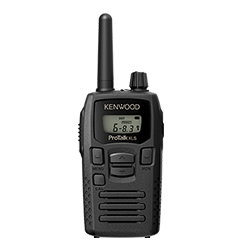 Increase security, safety and efficiency on your property with affordable on-site two-way radios from Kenwood Communications. The ProTalk® Radios are compact, easy–to–use, and perfect for maintenance, security, operations, administration and guest services. Properties vary in size from relatively small, single floor establishments to huge skyscrapers to sprawled out resort settings. Because of this, there is no “one size fits all” radio for all scenarios. Properties with 5–10 floors will be happy choosing a small, lightweight radio, while larger properties will need a four watt, or even a repeater capable model. Resort properties typically have several groups of staff members that need to have communications separate from one another, so radios that support multiple channels are recommended. This would allow the cleaning staff to have their own channel, separate from maintenance. If the front desk needs to send the cleaning staff to a room, they can simply switch to the “cleaning” channel before talking. Managers or other staff members needing to monitor all communications can simply enable “scan mode” on their radios to monitor all activity. Get the Kenwood advantage today. Recommended radio for Assisted Living Facilities Communications.